Emergency Medical Services (EMS) personnel are often the first medical providers to care for the polytrauma patient with traumatic brain injury. The prehospital environment brings with it unique technical and logistical challenges, as well as safety risks to providers, rarely encountered in hospital medicine. This chapter begins by describing the origins and structure of emergency medical services in the United States, followed by an outline of some of the inherent operational challenges of trauma care in the prehospital environment. 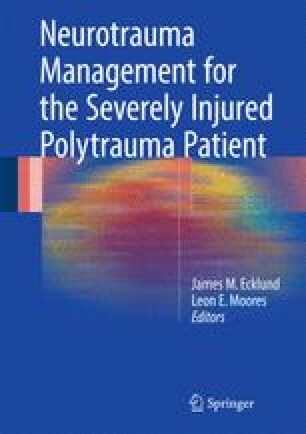 The current tenets of EMS trauma care are discussed broadly, followed by a focused discussion on the management of polytrauma patients with traumatic brain injury. Controversies and areas for further research, including rapid sequence intubation, the utility of the prehospital GCS score, resuscitation endpoints, and the diagnosis and management of herniation syndromes, are explored in detail. The chapter ends with a discussion of best practices in EMS-hospital handoff and multidisciplinary quality improvement. Firefighter fatalities in the United States. Available at: http://www.nfpa.org/research/reports-and-statistics/the-fire-service/fatalities-and-injuries/firefighter-fatalities-in-the-united-states. Accessed 24 Feb 2016. NFPA 1917: Standard for Automotive Ambulances. Available at: http://www.nfpa.org/codes-and-standards/document-information-pages?mode=code&code=1917. Accessed 24 Feb 2016. The Safety of Air Ambulances—https://www.hsdl.org/?view&did=463537. Available at: https://www.hsdl.org/?view&did=463537. Accessed 24 Feb 2016. Federal Aviation Administration. Fact sheet—FAA initiatives to improve helicopter air ambulance safety. 2014; Available at: https://www.faa.gov/news/fact_sheets/news_story.cfm?newsId=15794. Accessed 20 Feb 2016. National Highway Traffic Safety Administration. Crash injury research and engineering network (CIREN). Available at: http://www.nhtsa.gov/CIREN. Accessed 7 Mar 2016. Upstairs Care Downstairs: Delayed Sequence Intubation (DSI)//ACEP. Available at: http://www.acep.org/Clinical—Practice-Management/Upstairs-Care-Downstairs–Delayed-Sequence-Intubation-(DSI). Accessed 2 Mar 2016. Emergency Nursing Association Emergency Nursing Resources Development Committee. Clinical Practice Guideline: Non-invasive blood pressure measurement with automated devices. 2012; Available at: https://www.ena.org/practice-research/research/CPG/Documents/NIBPMCPG.pdf. Accessed 25 Feb 2016. Find Your Local Trauma Center—American Trauma Society. Available at: http://www.amtrauma.org/?page=FindTraumaCenter. Accessed 24 Feb 2016. American College of Surgeons. Searching for Verfied Trauma Centers: New Mexico. Available at: https://www.facs.org/search/trauma-centers?state=NM&country=United%20States. Accessed 22 Feb 2016. American College of Surgeons. Searching for Verified Trauma Centers. Available at: https://www.facs.org/search/trauma-centers. Accessed 21 Feb 2016. National Highway Traffic Safety Administration. Emergency Medical Services: Agenda for the Future. 1996; Available at: http://www.ems.gov/pdf/2010/EMSAgendaWeb_7–06-10.pdf. Accessed 7 Mar 2016.